Recently one of my husband's business contacts became a new father. My hubby wanted me to paint something for their baby. After seeing photos of the nursery done in pink and brown with pink and brown ladybugs, this is what I came up with. You can click on the image to get a closer view. A pink and brown dotted ribbon is wrapped around the edges of the canvas and tied in a bow at the top. Glitter is applied to the fairy wings. This was a fun diversion from my usual style of painting. My sweet daughter just started her own blog and you can check it out here. Please stop by and leave her a comment to welcome here to our community of blogging friends. My baby girl is such a cutie pie! 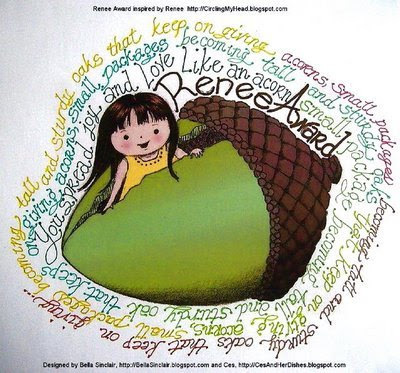 This week Kaili's Art Blog, Billy and Button, presented me with the Renee Award. Please check out my sweet blogging friend from Australia, Kailie's blog. She is so talented! "this is a brand new award, and I have the pleasure and honor of spreading the seed, watching it grow. I hope it finds its way to those who are like Renee: the acorn, a small package becoming a tall and sturdy oak giving more acorns, becoming tall and sturdy oaks, giving acorns…"
Thanks Kaili! I have a giveaway coming soon! 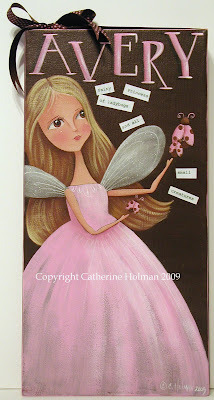 Catherine, your Fairy Princess painting is sooo beautiful! I just love your style! Did you ever take art classes or are you self taught? I'm always in awe of your designs. Your painting is so sweet & precious. Of course, I'm a fan of all of your work! What a sweet painting! I think that is sounds so perfect for the babies room! Love the painting! How cute that is! What a wonderful item for a new baby! Oh my, you should do more stuff like this! I love it. Cathie, I just love that Avery painting! You are so talented! I just don't know how you come up with so many ideas, you are a true artist!! Love your work! Now that is adorable! I can see you heading in yet another direction quite easily. Will check out the link when I find some spare time. Congrats to your daughter! Mom... I love this!! The colors are great and the fairy is so adorable. Love you!! How precious! I think we are feel like fairy princesses and your painting captures the beauty! I am SO excited! I have had my C H prints FRAMED! I'll be sharing them in a post soon! I love them and now I have your inspiration around me in your amazing art! I am excited.... oh, I said that! heehee! I posted pics of my study and your prints framed! Hope you can pop over for a visit (and that you love it! ) Thanks! Catherine, I love your Fairy princess from below...ow, she is so beautiful. I love your newest painting as well. I love the painting, it's perfect! I had more time and came back to enjoy your art some more. It is so beautiful and so much detail! Then i saw some of them are only 4"!!!!!! They are so detailed i thought they must be huge! I am absolutely green with envy of your skills. Blessings, and i sure hope i win the sign you made! You KNOW I love the pink and brown! It's really precious. So beautiful and girlie. Such the cutest painting. Love the browns and pinks.